Doreen Weppler-Grogan reports on a major new exhibition of Cuban art featuring the work of Miami Five prisoners Antonio Guerrero and Gerardo Hernandez, alongside contemporary Cuban artists which CSC will bring to the UK in April 2012. By staging a major exhibition and sale of Cuban art in London next spring, CSC is determined to see that the media silence surrounding the campaign for justice for the Miami is brought to an end. However, Beyond the Frame – Contemporary Cuban Art will have more than a campaigning focus. It is a serious presentation of Cuba’s visual arts, involving contributions by 25 of Cuba’s foremost artists, and a product of a close working relationship with the Visual Arts Council in Cuba. Alongside the artwork from Cuba will be contributions from two of the Five. 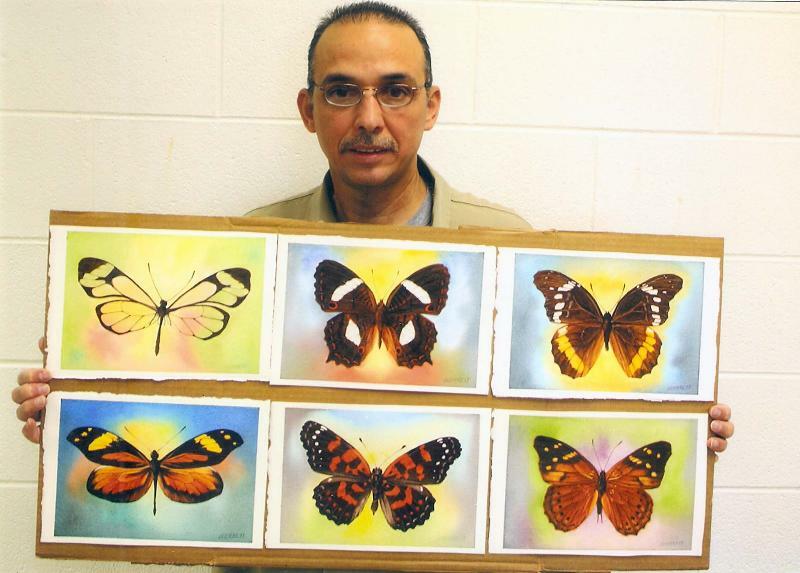 Antonio Guerrero and Gerardo Hernandez have both developed their artistic interests while in prison: Antonio with drawing and painting; Gerardo with cartoons. Additionally, prominent UK-based artists are being approached to donate their own work in support of the aims of the project. The exhibition will be staged at the prestigious Gallery 27 in the heart of London’s art district in Cork Street and will be an important event in London’s cultural calendar. The exhibition’s opening event will be attended by the Cuban ambassador, members of Antonio’s family, several of the Cuban artists exhibiting, patrons of the exhibition, as well as other important guests. The majority of those exhibiting from Cuba are well established on the international art scene, although a number of them have never exhibited in the UK. The 25 include Manuel Mendive, a past exhibitor in the UK who has been described as the most important artist practicing in Cuba today. Another is Alexis Leyva (Kcho), an artist and National Assembly member, who has treated the theme of migration in his work, but is also known for the cultural brigades he organised to areas devastated by hurricanes in Cuba as well as Haiti. Outstanding photographers who recorded the epic events of the revolution’s early days like Ernesto Fernández and Roberto Salas will contribute, as will the ceramicist and painter José Fuster. René Peña, an artist who explores through photographic images notions of race and identity in Cuba and has considerable international exposure, is another participant. There are many others of similar stature, and with each producing new work, the exhibition will make available an element of the rich cultural life of Cuba that is less familiar to many viewers, and on a scale not previously seen in the UK. The exhibition’s title points to the variety of audiences that will be interested in the exhibition: cultural enthusiasts and art lovers, past visitors to Cuba on package holidays, academics following developments on the island; art investors, campaigners for justice for the Five, amongst others. While the exhibition will showcase the great diversity and richness of Cuba’s plastic arts, the title Beyond the Frame will loosely link the works and appeal to the different audiences the show will attract. It suggests not only the role of the frame as it is traditionally seen in painting, as a boundary or restraint; but also the way the Five have been ‘framed’ by the US government. But by looking ‘beyond’ the frame, viewers will also consider what exists outside of the frame (perhaps considered, symbolically, as the cell of the prison), which is a source of optimism because it is the campaigning activity and the unwavering principles of the Five that will ultimately destroy the ‘frame’. Patrons for the event include (to date) artists like John Keane, the official Gulf War artist in 1991 and whose more recent work has treated the subject of detainees at Guantánamo Bay; John Byrne, noted Scottish artist and playwright, author of many works including the TV series Tutti Frutti; Richard Deacon, a Turner prize winner whose monumental sculptures can be found in sites at Warwick University, Toronto, Gateshead, and elsewhere; and the noted Latin American art curator, Professor Dawn Ades. Other patrons drawn from the cultural sector include actors such as Maxine Peake and Roger Lloyd Pack; cultural writers such as the celebrated John Berger; political writer and novelist Tariq Ali; and the poet Benjamin Zephaniah. The aim of the exhibition is to win support from areas not reached in the past, which will include personalities who the media finds it more difficult to ignore. A website is currently under production that will display the artwork and provide biographical details of each of the artists. This exhibition is a major undertaking for CSC. A project of this scale requires enormous funding that goes beyond what is possible to attain through the sale of the artwork. It is being organised by a committee that involves CSC campaigners as well as those with expertise in the arts and heritage sector. However, its success will depend on the activities and commitment of CSC members in campaigning for support and funding, and nearer the time, winning viewers to actually get down to Cork Street next April. If you have any expertise in any field related to this event contact Dodie Weppler, Beyond the Frame co-ordinator Tel. 07958 169627 or Rob Miller at CSC National Office on 020 8800 0155.